This plugin integrates J2Store with Virtual Merchant payment gateway, thus facilitating users who prefer Virtual Merchant to pay online. At the backend, joomla control panel, go to Extension -> Plugin Manager and open the Virtual Merchant (type = j2store). Payment Option Title -Enter Option Title here. This text will be displayed while listing the payment option. Logo or Image -This option is used to display the payment plugin logo in the checkout page. API Merchant ID -Here, you have to enter the API Merchant ID associated with Virtual Merchant account. API User ID -Here, you have to enter the API User ID associated with Virtual Merchant account. API PIN -Here, you have to enter the API PIN associated with Virtual Merchant account. Test Merchant ID -Here, you need to enter the Test Merchant ID, that is associated with Virtual Merchant demo account. Test User ID -Here, you need to enter the Test User id, that is associated with Virtual Merchant demo account. Test Merchant ID -Here, you need to enter the Test PIN id, that is associated with Virtual Merchant demo account. Thankyou Page Article ID -If you want to display thankyou message, you need to enter the article id here. The message will be displayed after payment completion page. Tip -ONLY FOR MULTI-LINGUAL SITES -For example, enter a language constant :J2STORE_TEXT_TO_DISPLAY_ON_SELECTION.Now you can go to Joomla admin -> Language Manager -> Overrides and create overrides for the language constant in all languages. Display text before payment -The text entered here is displayed to the customer at the order summary screen, before the customer makes the payment.You can enter language constant as a value here, if you are using a multi-lingual site and then write a language override. Refer the Display text on selection param. Display text on after payment -The text entered here will be displayed to the customer after he makes the payment. You can enter a language constant as a value here if you are using a multi-lingual site and then write a language override. Refer the Display text on selection param. 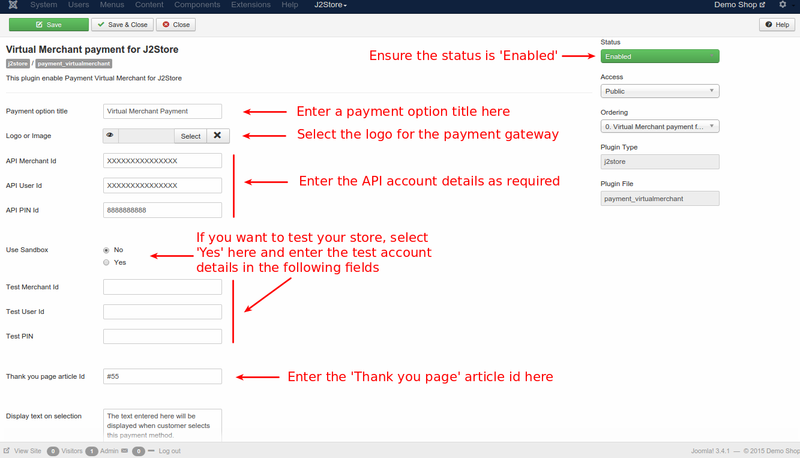 Display text on error in payment -The text entered here is displayed to the customer when there is an error in the payment process.You can enter a language constant as a value here if you are using a multi-lingual site and then write a language override. Refer the Display text on selection param. Display text if customers cancels payment -The text entered here will be displayed to the customer when he cancels the payment at the gateway (NOT in your site).You can enter a language constant as a value here if you are using a multi-lingual site and then write a language override. Refer the Display text on selection param. Payment button text -The text of the payment button. The button will be displayed at the final checkout step. Debug -This option is used to enable/disable log file.